Wild Horse Education is NOT in attendance. We submitted written comments but resources are very slim and we felt our time was better utilized on the ground. We are meeting in several districts this week and continuing to work gathering data and addressing things on the roundup schedule. We understand the frustration and sense of NOT being heard at these meetings. A supporter asked if we would publish her comments… these are what public comments reflect, a complete lack of confidence in the BLM Advisory Board. 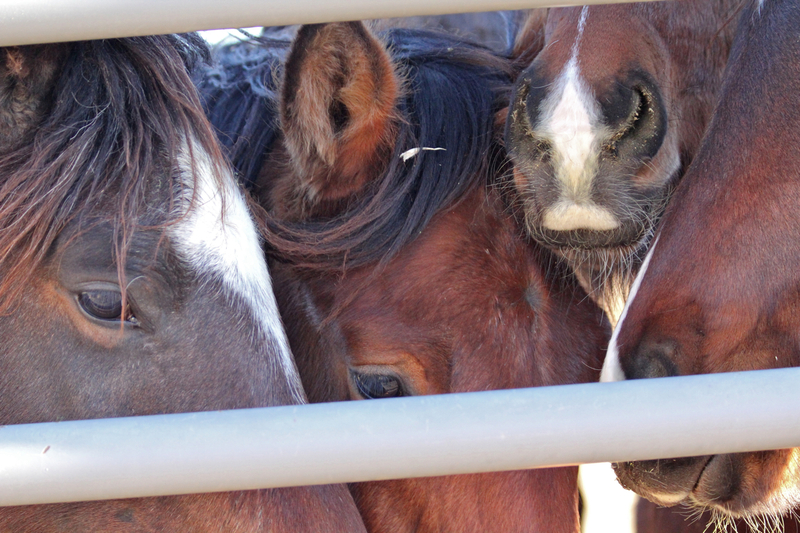 Wild horses at Palomino Valley Center looking for homes. They call themselves “United Horsemen” and the “National Horse and Burro Rangeland Management Coalition.” Yet there is not a single equine group among them except for the quarter horse groups who want to breed the ‘best of show’ and have an easy, but profitable way to dump the rest. Their agenda is to sterilize and to remove and slaughter or harvest and slaughter the wild horses and burros on our public lands. Equally their agenda is to slaughter domestic horses. They have made a mockery of the mandate for diversity on our National Wild Horse and Burro Advisory Board now prevailing as the majority of the Board with 5 out of 9 of them having cattle ranching interests. They are Boyd Spratling, Callie Hendrickson, John Falen, Robert Cope, and Rick Danvir. They are a scam and a sham on our Advisory Board promoting the idea of what is best for the cattle and the hunted but pretending to talk to what is best for the wild horses and burros. They want to dismiss wild horse and burro advocates saying they just exude “emotions.” On the other hand, they maintain they , the ranchers, hunters, tribal leaders and more speak reason and WOW! science. Yet they produce no scientific methods or studies. They parade out pictures of dying horses supposedly on the range. Yet they provide no GPS locations for the horses and no timing of events. They maintain the wild horses and burros are “overpopulated” on our public lands. Yet they have no validated means by which all the wild horses and burros have been counted on our public lands. Even the employees of the Wild Horse and Burro Program say they are trying to work with the USGS to accomplish a more informed count. They estimate 40,000 or “PULL IT OUT OF YOUR HAT” 100,000. Let’s see: 40,000 horses and burros, 245 M acres the BLM currently manages…That would be 1 horse/burro per 6,125 acres. OVERPOPULATED? But wait, wild horses and burros are only allowed on 31.6 M acres of our BLM managed lands. So that would mean 1 horse/burro per 790 acres. Again, OVERPOPULATED? Then estimated is there are 20 M deer, 1M elk, 700,000 pronghorns, and 70,000 big horns on Federal, state, and private lands. AGAIN, WHO IS OVERPOPULATED IF YOU WANT TO PLAY THAT GAME? b) Gather and remove the horses and burros in the 166 BLM HMAs (Herd Managed Areas) down to low AML(the non-scientifically established appropriate management levels). Gus Cothran, the retained geneticist for the BLM has made different statements at different times. From time to time he has said a very minimum of 150-200 horses or burros is needed in a herd to maintain diversity and viability, to prevent inbreeding and anomalies, and to obviate the death of the herd. Of the total 165 herds, 105 herds have low AMLs of less than 100, 26 have low AMLs of 100-150, 14 have low AMLs of 150-200, and 14 have low AMLs of over 200. So according to Cothran, if the 165 herds are brought down to low AML, 131 of the herds out of 165 will, in time, become unhealthy and unsustainable and only 28 will remain intact and healthy. c) The WHB Program will tell you the HMAs are clustered together with horses/burros moving among them so that the low AMLs are higher if viewed as clusters. However, the program has no scientific studies to verify this thinking. d) The WHB program will also tell you Gus Cothran said,’ just import horses/burros from other herds, and the horses/burros will be just fine.’ However, the horses are supposed to be where found to maintain their genetic uniqueness, not moved around. don’t talk about the $ 120 M and much more the government is investing in subsidizing the public land cattle ranchers. 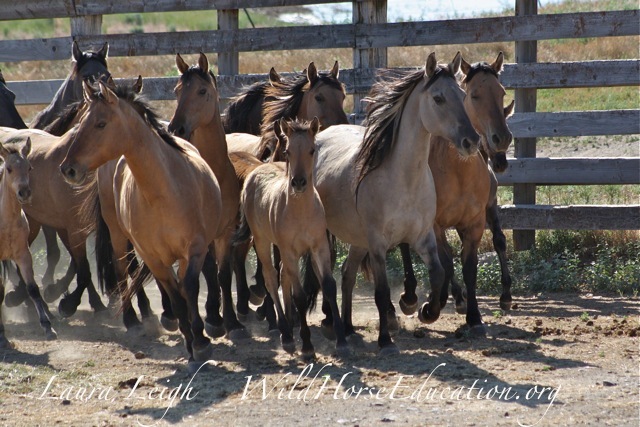 f) The answer to avoidance of this high cost of corralling the horses/burros is slaughter. Of course, an alternative idea is the ranchers can harvest wild horses and slaughter them for a profit. After all, profit is down for cattle consumption in the United States as more and more people are moving away from a meat based diet and wild horses may provide a good supplemental cash crop. 9) So sterilization, harvesting for slaughter, or just removing down to the low AMLs and slaughtering is the answer to the fabricated idea of “overpopulation,”and presents as genocide. Following the ranchers and hunters then will have more public land to do as they wish, and the ranchers may even increase their profits with harvesting and slaughtering. It is not just the wild horses and burros that are in jeopardy on our public lands today because of the ranchers and hunters, but it is also the bison, the wolves, and the carnivores such as the coyotes, the lions, the bears, and more. 10) Building a case and executing a devious plan against a minority and the voiceless so that the profit and killer motivated can gain more is unconscionable. a) It is time to honor our living cultural and historical treasures. b) It is time to put our resources into providing for adequate space, forage, water, and appropriate, sustainable healthy numbers of horses and burros on our public lands. c) It is time to push back on the special interest cattle ranchers and hunters who are pillaging our public lands and are destroying the animals who call this place home. It is time to re-devote our public lands to the American public with a multiple use mission. d) It is time to get rid of the Spratlings, the Henricksons, the Falens, the Copes and the Danvirs, and to put biologists, geneticists, equine veterinarians, and equine behaviorists on the Advisory Board who can advise in the best interests of the wild horses and burros, not in the best interests of cattle and herbivores who the hunters want for the kill. e) It is time to move now before this genocide of our wild horse and burros is complete. to appreciate. It is important for them to remain on our public lands and to overcome the lying, narcissism, and greed of the ranchers and hunters who seek to destroy them for their own self invested interest. Bonnie Kohleriter, Former scientist focused on teaching and applying scientific methodology and owner of three, three year old Mustangs brought directly from the range in the Tonopah, Nevada, area at 5 months. According to Environmental Working Group’s (ewg.org) ‘Farm Subsidy Database’, from 1995-2012, Mr. Falen has received $633,004 in subsidies for livestock, wheat and barley, $335,042 just since 2005. That’s a lot of incentive to keep that land wild horse-free, don’t you think? Agree, sure looks like it! Thank you lisa. In field but the board is not in any way credible.